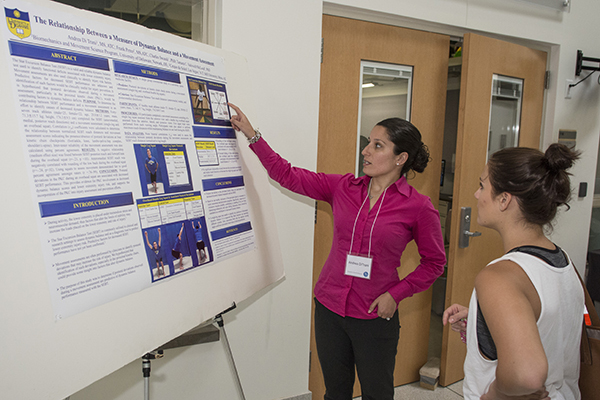 Students present posters at the annual Biomechanics Research Symposium. 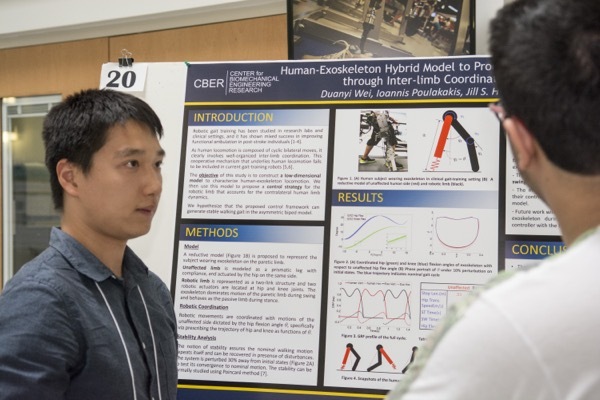 10:10 a.m., May 14, 2015--Close to 100 participants turned out for the 12th annual Biomechanics Research Symposium at the University of Delaware on Friday, May 8. 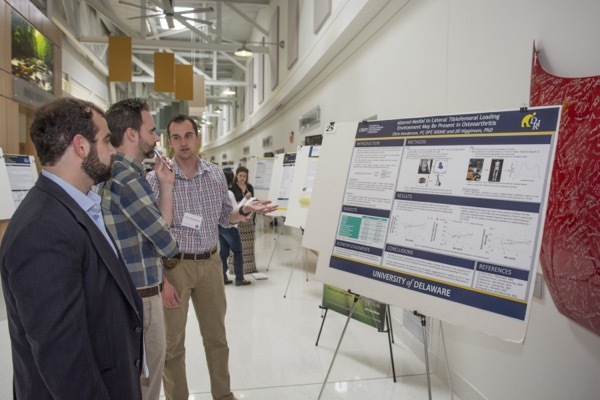 Held at UD’s Science, Technology and Advanced Research (STAR) Campus, the event was hosted by UD’s Center for Biomechanical Engineering Research. The program included 10 podium presentations and 29 posters on topics including human motion after injury and stroke, the mechanics of musculoskeletal tissues, the development of devices and technologies for measuring and correcting human motion, and the transport and effects of drug therapies on cartilage and bone. Elliott’s research focuses on the changes that occur in load-bearing fibrous tissues such as the intervertebral disc in the spine and the meniscus in the knee during development, growth and aging, as well as after injury and therapeutic interventions. “It’s challenging to measure the stresses and strains on tissues without disrupting the tissues and thereby altering the measurements,” she said. 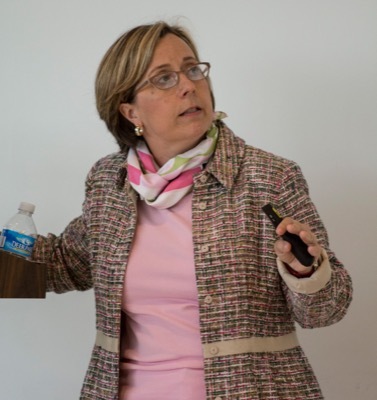 She shared with the audience highlights of her multi-scale approach, which spans from the entire joint level to the tissue scale and the micro scale. Her work integrates mechanical testing, mathematical modeling, and multi-scale imaging. Using MRI-based biomechanics and finite element modeling, Elliott and her team are getting closer to seeing “how the cat works” without disabling it. Four awards, sponsored by the Delaware Rehabilitation Institute, were awarded to student researchers, two each for podium presentations and posters. The event was organized by CBER director Michael Santare and Elaine Nelson. Student committee members included Andrea DiTrani, Paula-Marie Ferrara, Danielle Gerstman, Chris Henderson, Kathleen Madara, Jackie Palmer, Alex Razzook, and Aaron Struminger. CBER is an interdisciplinary center whose mission is to provide engineering science and clinical technology to reduce the impact of disease on the everyday life of individuals. For over 20 years CBER has encouraged cross-disciplinary research across various academic departments at the University of Delaware including Mechanical Engineering, Physical Therapy, Biomedical Engineering, Biological Sciences and Kinesiology and Applied Physiology. Over the past year, CBER has focused effort on helping to bridge the gap between academia and industry by working closely with the Interdisciplinary Senior Design Capstone Course in the College of Engineering where real life problems are being studied and solved.